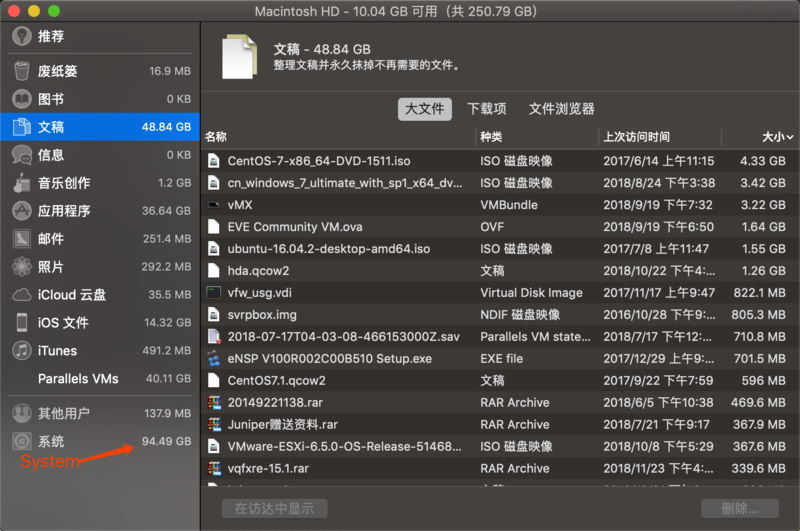 How to recycle some magnetic disk of System on Mac OS? The system use 94GB disk. how to recycle some magnetic disk? in there I can not click it. my version is 10.14 (18A391). Your system storage space is more than usual. Cache files can take up a lot of space. Open a Finder window and select Go in the menu bar. Type in ~/Library/Caches. Delete the files/ folders that are taking up the most space. Type in /Library/Caches (simply lose the ~ symbol) And, again, delete the folders that take up the most space. Another thing that could help is starting in safe mode. I would look at moving some data or files onto separate storage. There are also apps that will remove unused languages, duplicate files etc from the system if you want to look at those. Mac OSX hard disk gives invalid PEOF - how do I back up data? How to exercise a new hard drive by erasing multiple times with Disk Utility app? Is my system disk damaged? Using dd to image a corrupted Windows disk?